Thallus: peltate, scattered or in irregular patches, individual thalli up to 2 mm diam. ; margin: often strongly undulated upper surface: dark olive green to olive brown soredia: farinose, black, marginal, in linear to orbicular soralia upper cortex: lacking but with a yellow to brownish epinecral layer (up to 10 µm thick) medulla: with a poorly delimited algal layer in the upper third, composed of loosely interwoven hyphae with elongated (2.5 µm wide) or globose (7 µm in diam.) cells lower cortex: 20-75 µm thick, pseudoparenchymatous, with globose hyphal cells (7-8 µm in diam.) 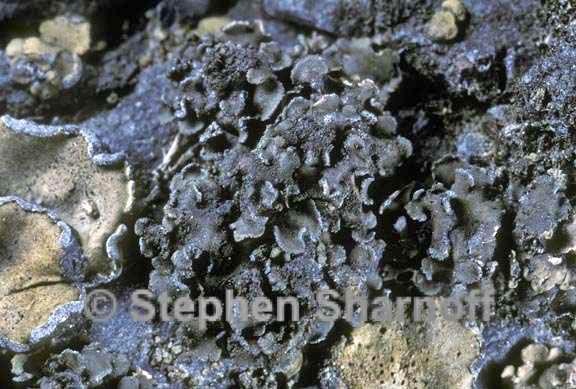 lower surface: paler than the upper surface, attached by an umbilicus Apothecia: rare, one to several, adnate, with a raised rim when mature; epihymenium: light yellow, K-; hymenium: I+ wine-red, 150-170 µm high asci: clavate to obclavate; ascal wall: I+ orange but blue after pretreatment with K, >100-spored ascospores: globose to ellipsoid, 5-7.6 x 3-4.5 µm Pycnidia: spherical, up to 150 µm diam. conidia: fusiform, 3.1-3.7 x 1.2 µm Spot tests: all negative Secondary metabolites: none detected. Substrate and ecology: usually on acidic rocks but occasionally on calcareous ones in deserts and other open, arid habitats World distribution: SW North America, Australasia and southern Africa Sonoran distribution: desert areas of Arizona, southern California, Sonora, Baja California and Baja California Sur.